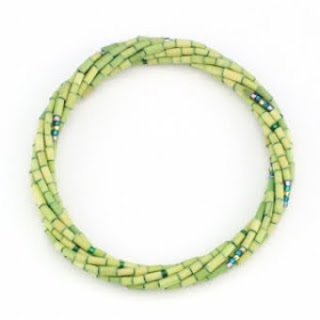 I want to introduce you to Zulugrass, one of the lines of natural material jewelry marketed by The Leakey Collection. The company was founded in 2002 by Katy and Philip Leakey when a devastating drought in Kenya (2001) forced the men to leave behind the women and children, so they could take the surviving cattle far up country in search of grazing land. The Leakey’s found themselves helping to support as many as 100 Maasai families by giving them money for food, school fees, medical expenses and housing. This was not sustainable for either party and the Leakeys knew they had to find another way. The answer came from the fibrous, hollow, drought-resistant grass that is a plentiful natural resource of Kenya. It so tough that even the Maasai’s hungry cattle won’t eat it. In fact it was regarded as such a unusable nuisance. Now that very grass is turned into beautiful jewelry. Zulugrass is the flagship line in their collection. The work includes the design and manufacture of contemporary jewelry that is hand made by the Maasai women and men of Kenya from environmentally sustainable materials. 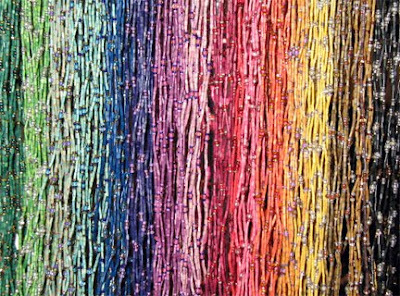 Zulugrass is sold in individually or in multi-strands, which allows you to get precisely the color, depth and weight of the jewelry that you want. It has an earthy, organic look and feel, yet is completely modern. I am really pleased to be able to pass on to you a gorgeous piece of Zulugrass jewelry that was sent to me for review: a multi-strand twisted green bracelet. Leave me a comment below and you’ll be entered into the drawing. Tweet the contest or post it on your facebook, etc and you can leave a second comment to be entered twice! If you are involved with any fund-raising or socially beneficial companies like this one, please leave a link as part of your comment…we all want to know what opportunities are out there for helping others through our work! They're beautiful! Love the green. I'd love to win this! It looks gorgeous! Hi, what a gorgeous piece of Zulugrass jewelry that you're having for your giveaway. Thanks so much for this chance! I hope that you have a wonderful rest of your day and everyday! I would love to have it because I have never seen zulu grass before. the picture is beautiful. Wow! This Zulu grass is beautiful! Jenny, I have to go check that out...I'm *from* State College! You? I think it's amazing to use materials from the earth as much as possible! Beautiful piece! What a beautiful spring color! Thanks for sharing this--I'm always on the lookout for new organizations like this. This is stunning!! I have an allergy to nickel which keeps me from wearing most jewelry that I can afford :-)), so I usually make my own without clasps or nickel-free findings when I can find them, so this is perfect. Thanks so much for presenting this. The bracelet is very cool looking - and gives me a better idea what to expect if using the Zulugrass. Thanks for sharing. Bracelets are really my thing, and with springtime being close to unfolding, I'd love to win this very springtime bracelet! Thank you! Will tweet and stumble you now! What a wonderful idea -- I love anything that empowers women in poor societies to pull themselves and everyone around them up! OMG, that's the most gorgeous stuff I've ever seen! That is sooo pretty. Thank you for the chance to win. It's beautiful!! but I would love to see in in person! I love the jewelry-beautiful and so unique! Wow - I have to learn more about this stuff. Maybe I could incorporate it into some of my bead crochet work. Thanks for the chance to win! I'm familiar with Zulugrass but have never worked with it before. I use a lot of recycled and fair trade beads in my designs so this a whole new venture for me. I am constantly looking for ``green`` jewelery materials, particularly with a social-economic beneift. My son asked me to make some of my jewelry to raise money for the local children`s hospital - we are planning to do some school craft fairs next fall. OUr specialty are bracelets/necklaces made from hand-embroidered felt beads. Just gorgeous! AND a terrific story of how the company was started. Thanks. Such a springy green shade, love it! I love the video that goes with this post! It's full of really creative ideas! I love the bracelet so much that I stumbled, tweeted and facebooked you all over again! :o) So neat! thank you! How pretty. Anyone would love to win. So glad to learn about Zulugrass. Thank you also for the giveaway! Beautiful bracelet. How wonderful that they have found a way to make an unuseable resourse into something useable. I've collected a bit of Zulugrass jewelry when we travel to Sanibel Island, Fl. That's the only place I've known to sell it! I'm so glad to see this info on it and new work. I love Zulugrass jewelry. I have a friend who travels and has seen these up close and is in awe of the women who make them. I visited the Leakey Collection site and they have some awesome Zulugrass items!! It's very cool, and I know it would go with...me! Thank you for sharing that link, Cindy! Very pretty! And a great idea too. Thanks for the opportunity! I can already see a million ways to use this and would love to have the bracelet so I can see the fiber! So pretty! How great to make something out of "weeds" that's so beautiful. Thanks for the interesting story, too. I was able to live in Kenya and saw where the Leaky family lived. It was really amazing! Hey Cyndi! I've never seen Zulu grass before! This is very cool! I'd love to win it and see it in person! Thanks as always for sharing your passion and creativity! P.S. The giveaway bracelet looks awesome! Hi, hope you don’t mind us leaving a note to tell you about our fabulous Ugandan Recycled Paper Mzuribeads, Barkcloth, Banana leaf, and recycled Glass beads ON SALE at MZURIBEADS.COM. That stuff looks awesome. I think I need to try weaving with it!